One of the challenges I face as a homemaker is preparing the weekly menu for my family. While I rotate my family’s favorite dishes every now and then, I try to come up with new dishes that hopefully they would enjoy. Currently I am at a stage where I need not to worry much about what they want as my children are still too young to request for a TexMex night of tacos & burritos or an All-American night of burgers, fries and pizza. I figured I should enjoy this for I only have a few more years when they’d appeal for hor d’oeuvre, bone marrow steak or other tedious meals.’Til then, I’m just sticking to recipes I’ve mastered. So here’s another easy peasy recipe that mommas & even poppas (tama ba, pops? popsicle? haha) can do under 30 minutes. It only takes 5 minutes to prep and 20 minutes to cook and just 5 ingredients you have in your kitchen. I’m slowly starting to appreciate our oven despite it being manual. This means I have to take a peek every now and then to see if the temperature’s right. Lately, I’ve been into the whole baking, roasting, grilling and steaming thing. Maybe because I’ve been trying oh so hard to eat healthier and be more conscious when it comes tocooking & preparing healthier or at least better alternatives to the usual processed food. First, pre-heat oven to 250 degrees celsius. 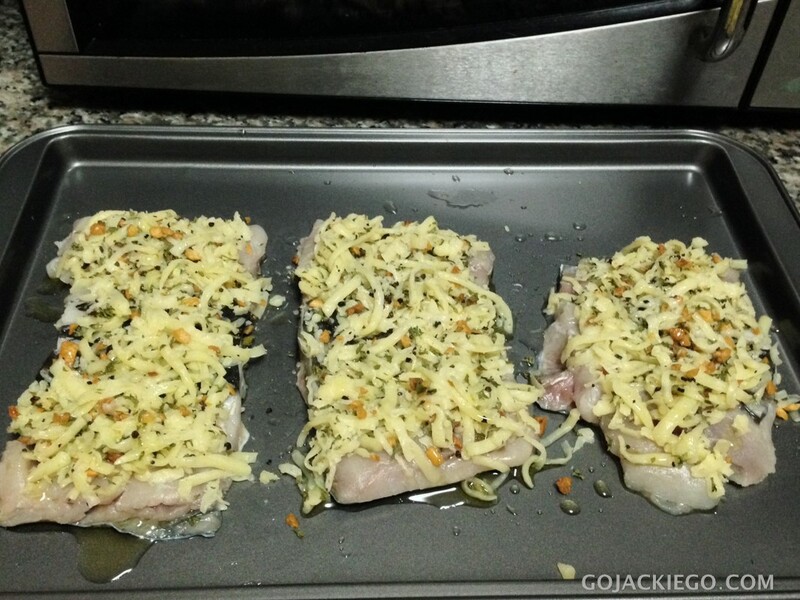 Next, line up the fish fillets on a baking tray (you can use a cookie sheet so the fish skin won’t stick on the tray. If you don’t have one, grease the baking tray with oil. 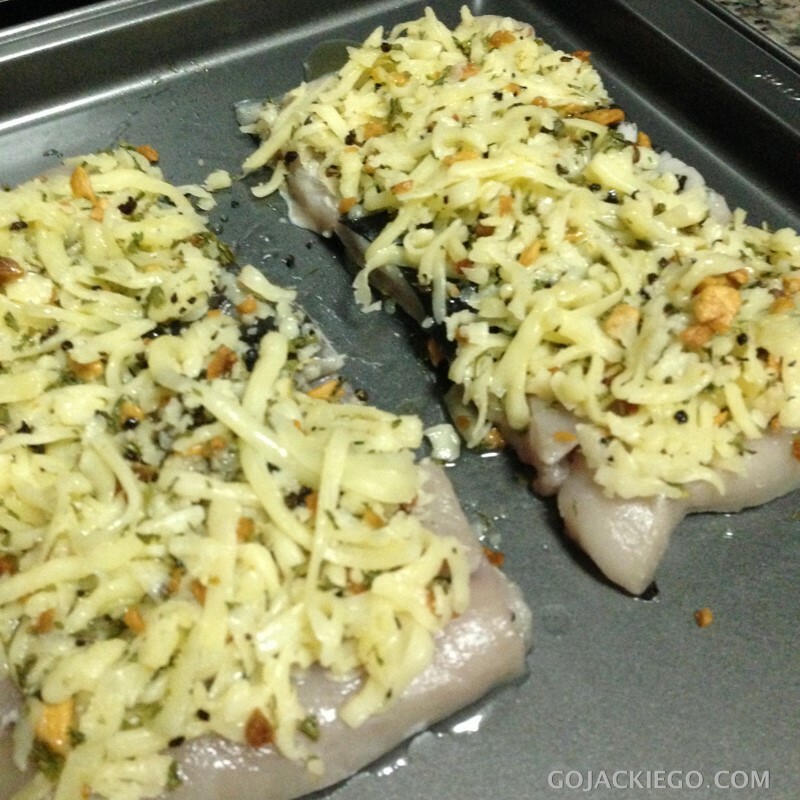 Then, rub the fish with a bit of salt & pepper, then sprinkle it with mozzarella cheese & garlic bits and drizzle EVOO all over. You can opt to sprinkle the fish with parsley flakes, freshly ground pepper and a squirt of fresh lemonade juice for that salty, tangy taste. 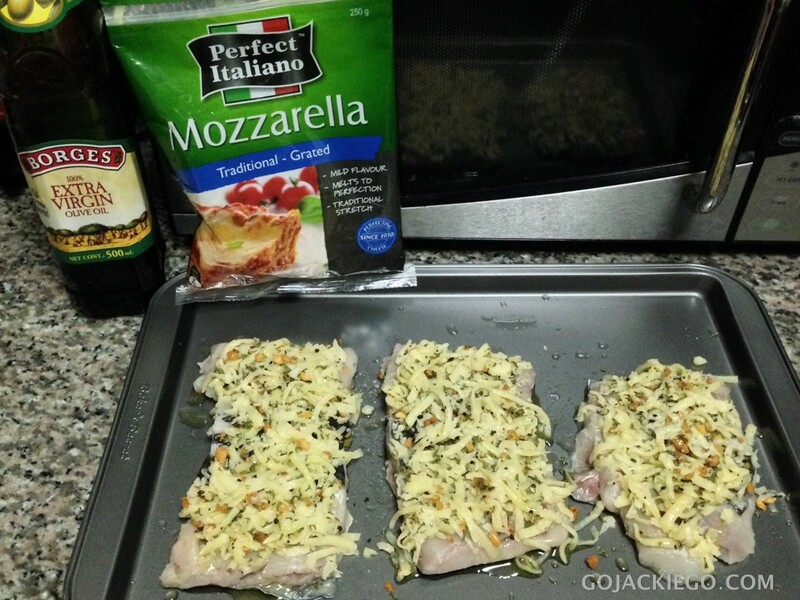 Pop it in the oven and bake for about 15-20 minutes until the cheese melts. What I love about baking is that I can do other things in 15-20 minutes. I can wash the dishes, sweep the floor and make the table while the dish cooks. O di ba? Multitasking at its finest. Very, very, Stepford Wife lang ang peg. Viola! 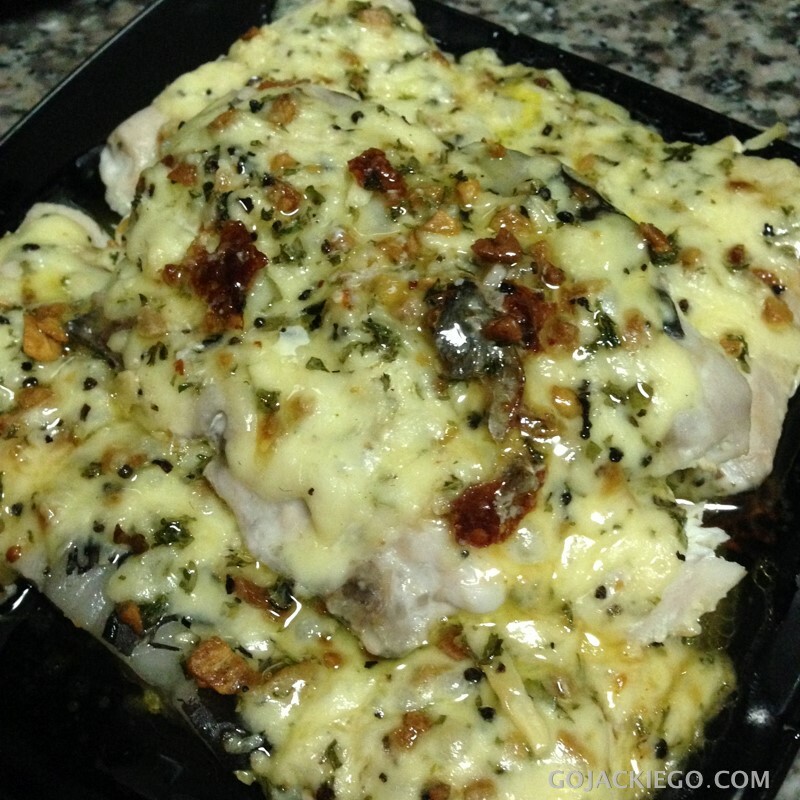 Baked Cheesy Garlic Fish. This dish got a thumbs up from the GJG familia! It’s another staple dish in our home. Anything baked looks intimidating but it’s really an easy dish to make. 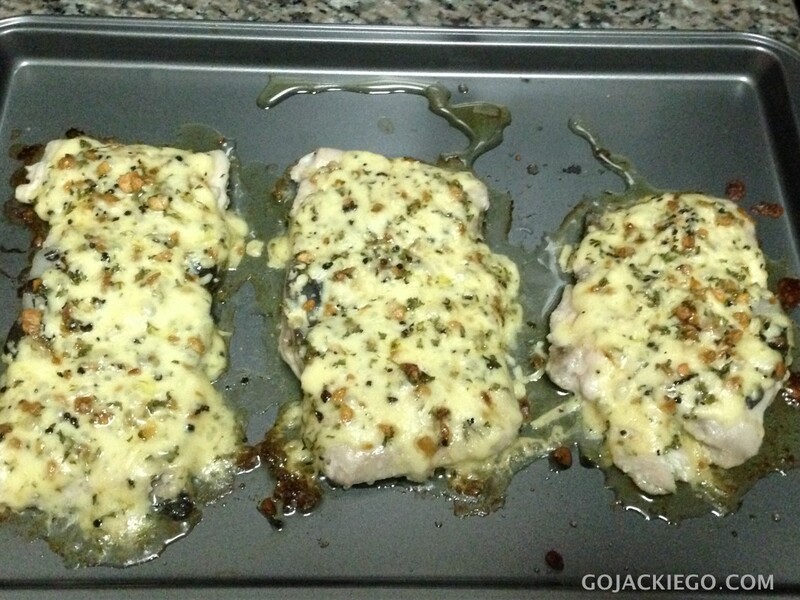 We love baked fish in our house! I love baking any type of dinner because it’s so easy and like you said, easy to do the side dishes or other chores while the oven does the work for you. Sometimes I like to do a casserole. That way I do everything in one pan! Veggies and all! PIck up your Italian sausage at Earle’s, S&R, or Santi’s. Roast it in the pyrex pan with sliced onions, and bell peppers. I like to mix it up with red, and green (and sometimes yellow) just for the color. Toss it all in some olive oil, salt, pepper and dried parsley, oregano, and basil. Bake at 350 F for about an hour. Then when you know the sausage is cooked, turn up the heat so that you can brown the sausage a bit 🙂 I usually serve with garlic and oil pasta, garlic bread, or french bread and make it a hero sandwich. LOVE LOVE LOVE those simple oven dishes! What oven do you use? Hi Tin! I use a gas stove oven. 🙂 I tried using it with an oven toaster but it required me to pan fry the fish first before popping it the oven toaster.